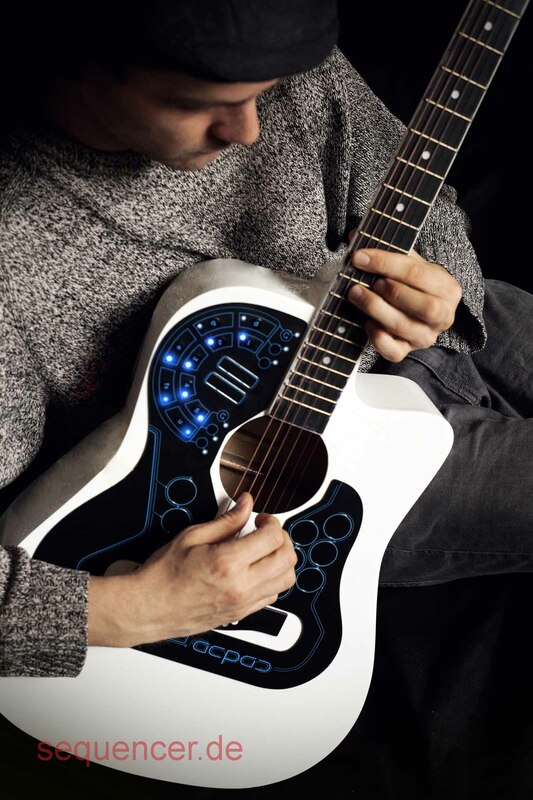 AcPad – turns the guitar into a real instrument! see it in action – if you can – just catch Robin playing somewhere since it’s the best „advertisement“ for this – so – it’s not a product but something he did because it was needed doing the music..
btw – no, it’s not the drums / pads used that makes it special..
so this looks a lot more to really have the guitar for everything to input as melodic and rhythmic aspect in the music and – as always – just play it! why? because there’s a lot of more sounds and loop stuff possible – so it doesn’t matter what kind of input you prefer – so why playing „keys“ when you can do it with strings as well? it took 3 years of research and working on the music itself to make Acpad what it is now. It’s officially called a controller but it is in fact an enhancement to the guitar being an electronic instrument and still be able to use all the positive things about guitars – still! Does it convert all guitar notes into midi polyphonically….or does it just trigger sounds and loops….?? yep, appears to do that job. if in doubt just ask the manufacturer! I need one. When and where are they available? will be this year – just sub to the site – they will send a newsletter for early birds..
what kind of price would this run? would it worth it instead of just buying a keyboard workstation? Korg Forums :: View topic – M3 spinoff?